One of the most important piece of gear for any traveler is their personal carry-on item. This bag typically holds some of the most important things that we take with us on any trip, including our notebook computers, e-readiers, passports, documents, and perhaps most importantly the snacks we're going to eat on the flight. So finding just the right bag to accompany us on our travels can be critical, particularly in this day and age when there are so many options to choose from. Recently, I've had the opportunity to test out the new FlapJack Pack from Osprey, and have come away quite impressed. The bag is versatile, durable, and looks good too. On top of that, it also has plenty of storage options, and some nicely integrated features that can help keep you stay organized while on the road. The FlapJack pack has been a part of the Osprey line-up for a number of years now, but it has recently undergoing a redesign that gives it a streamlined, modern look. If you're familiar with Osprey's line of outdoor backpacks, you'll see some of the company's distinctive lines on display here as well, although the FlapJack definitely has a style all its own. The updated version of this bag features a unique design that also stands out from the crowd. We all know how important that can be when traveling through an airport filled with a lot of luggage that all looks alike. Inside the pack, the FlapJack doesn't disappoint either. The main compartment offers plenty of storage capacity and includes separate sleeves for both a laptop and a tablet too. There is even a zippered pocket that is the perfect place to store important documents, such as airline tickets, hotel reservations, passport, and so on. But even when you have all of those slots filled there is still room to carry a jacket, camera, some snacks, and other items you'll want to keep close at hand. The exterior of the bag has an additional zippered pocket on the front that is designed purely for keeping you well organized. It contains several small pockets, penholders, and a keyclip that, each of which is extremely useful for finding important items quickly and easily. Whether you're in the cramped confines of a plane, passing through security at the airport, or wandering around a foreign city, you'll appreciate knowing exactly where your pens, notebook, charging cables, and other items are at all times. Additional storage options on the FlapJack include a handy zippered pocket that is hidden beneath the low-profile handle on the top of the bag. This compartment is perfect for stashing a smartphone, passport, or other small items you want to keep safe from prying eyes. But, I would have liked to have seen Osprey incorporate some kind of RFID protection – like the kind found on its Document Wallet – into this pocket. This helps to prevent thieves from using high-tech surveillance equipment to steal sensitive data, including credit card numbers, contact info, and so on. A water bottle holder along one side of the pack is a nice touch as well, while a long, zippered sleeve that runs the length of the other side of the bag can hold things like a small tripod or collapsible trekking poles. When Osprey decided to relaunch the FlapJack this past fall they elected to go with durable new fabrics that are more moisture resistant than what they had used in the past. These materials help keep the interior of the backpack dry, further protecting their contents from harm. Those same fabrics also happen to be quite resistant to wear and tear as well, and after a bit of use, the bag remains free of scuffs, scrapes, or tears of any kind. The FlapJack also features high quality buckles, comfortably padded shoulder straps, and easy-pull zippers. All of these different parts help to reinforce the legendary quality that we've come to expect from a product with the Osprey logo on it. 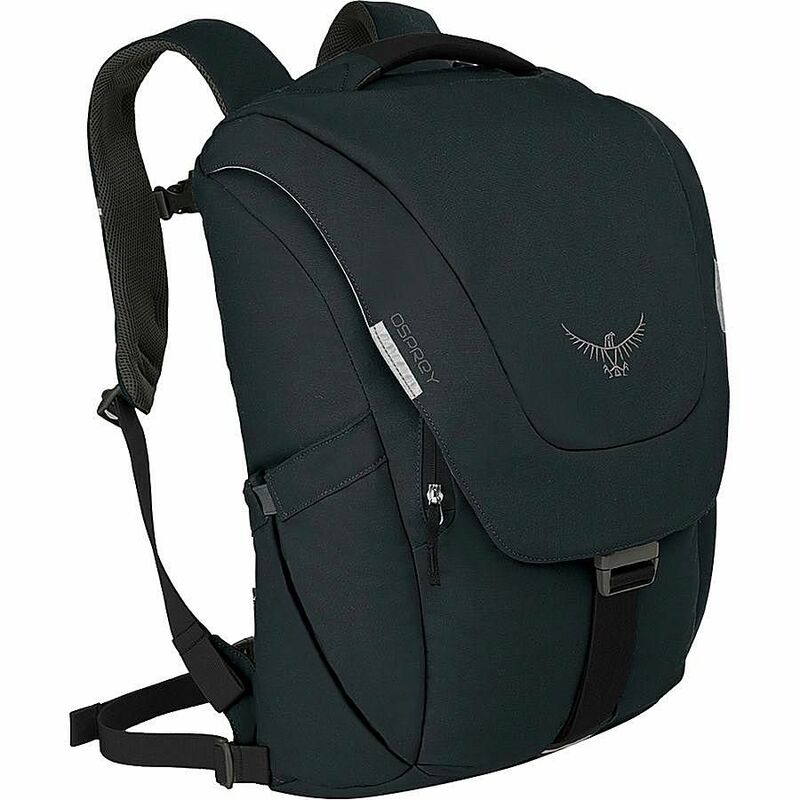 Of course, like all of the company's bags, it is backed by the All Mighty Guarantee, which ensures that Osprey will repair or replace the item as long as you own it. You can't ask for much more assurance of a great product than that. If you're in the market for a new casual backpack for use during your travels, the FlapJack Pack is a great choice. I love all of the storage options that it provides, and how comfortable it is to wear, even when weighted down with lots of gear. As someone who hits the road frequently, this is a bag that I want to have with me at all times. Not only does it carry all of my expensive electronic gadgets safely, it allows me to stay well organized too. On top of that, while the FlapJack will never replace Osprey's line of fantastic daypacks, it can be used for a short hike on a trail in a pinch too. The FlapJack pack is available now for $110. And for those who prefer an over-the-shoulder messenger bag, the FlapJack Courier is also available for $100.